Who are we? 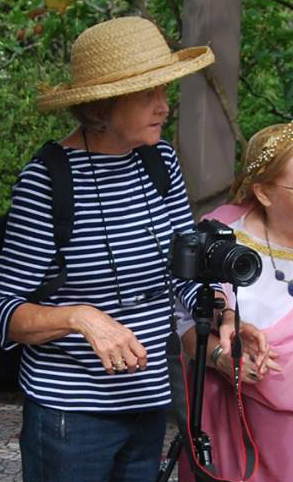 We're a group of good friends devoted to Roman Living History displays. Our members are from all walks of life. Many are skilled in engineering, metal working, blacksmithing, armory, and handicrafts. Some have degrees in Ancient History, Classics, Latin and Archaeology. Most are interested in the performing arts, or martial arts and sword fighting. Together we have a wide range of talents to form an effective team that really enjoys both educating and entertaining the public. This page helps to introduce us, and put a public face to our club. 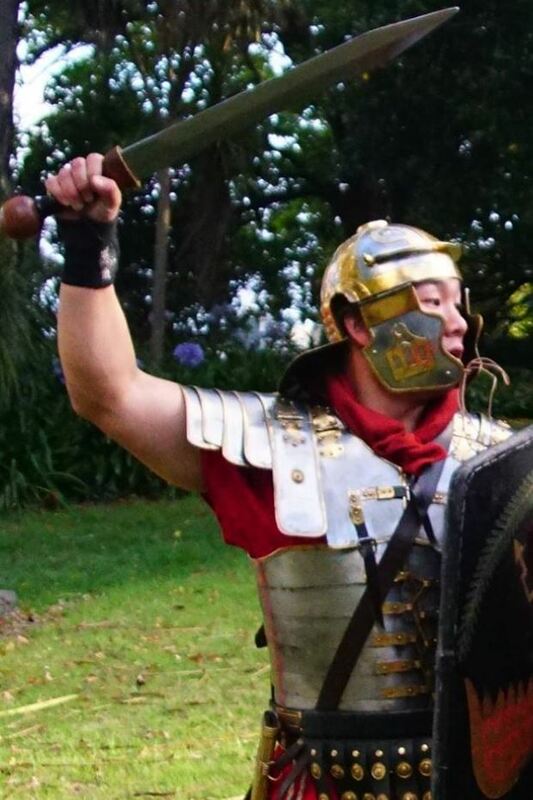 ​Jae Sung Park (Lucius Licinius Lucullus) - our Tesserarius, holds an MA in Ancient History from Auckland University. 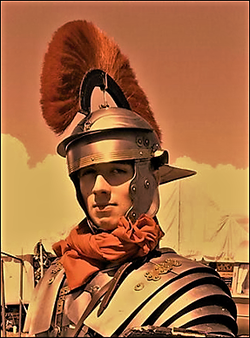 He leads the younger members, and fights as both legionary and gladiator, with mastery over a range of weapons including sword, spear, bow, sling, and ax. His fabricae workshops in leather and metalwork include slings, tunics, woven belts, bows, and balteus. 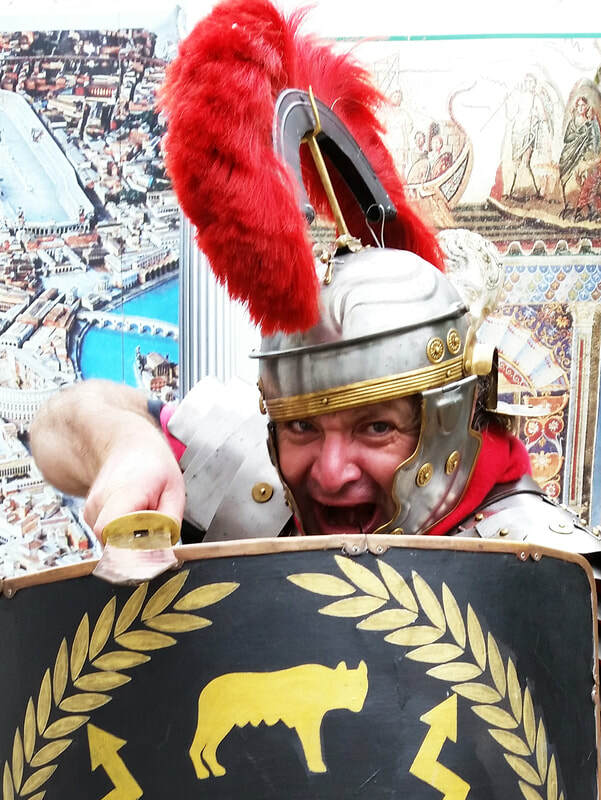 Darren White (Marcus Albus Britannicus) is Head of Classics at an Auckland college, and an expert in Roman and Greek history, literature and philosophy. 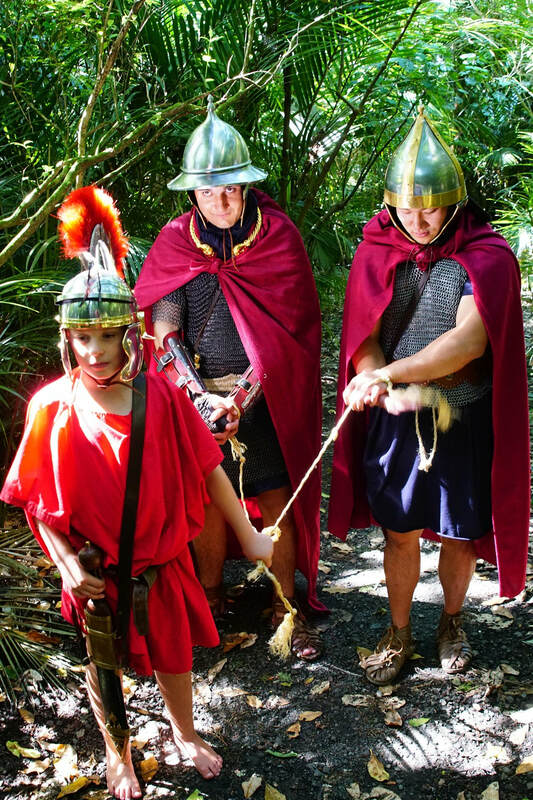 He had a lead role in Netflix Roman Empire 2, which was filmed in NZ using club members as Romans, and from that success has since gained more starring tv roles. Elen Rogers designs her own range of Ellie's Jewellery that can be custom-made to your order. She is a noble matrona and Roman domina that helps run the camp, support the troops and records the shows. Many of the videos seen on this site have to be credited as Ellie's work. 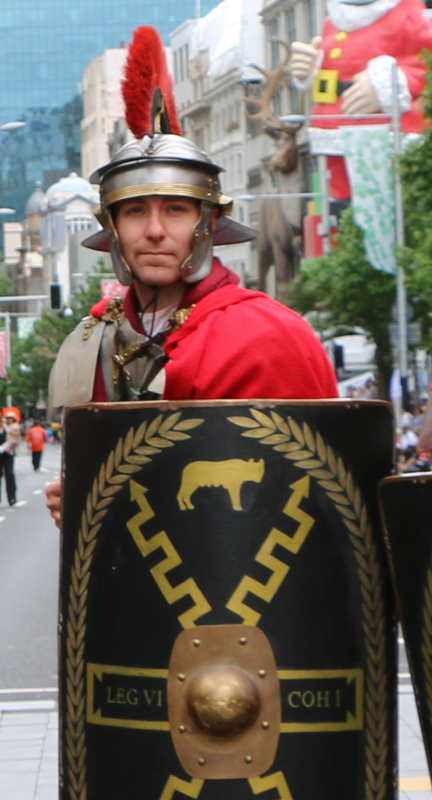 Lance Bridgford (Marcus Agrippa Pontus) is an Associate Member, a good Roman, loyal, steadfast and true. ​He is an avid cyclist and a Property Investor. More inclined to the Legion than the gladitorial arena. Garry Hill fights in the Roman arena as a provocator gladiator, Garricus of Syria, and is here shown holding the palm of victory awarded by the Priestess of Fortuna for killing his opponent. 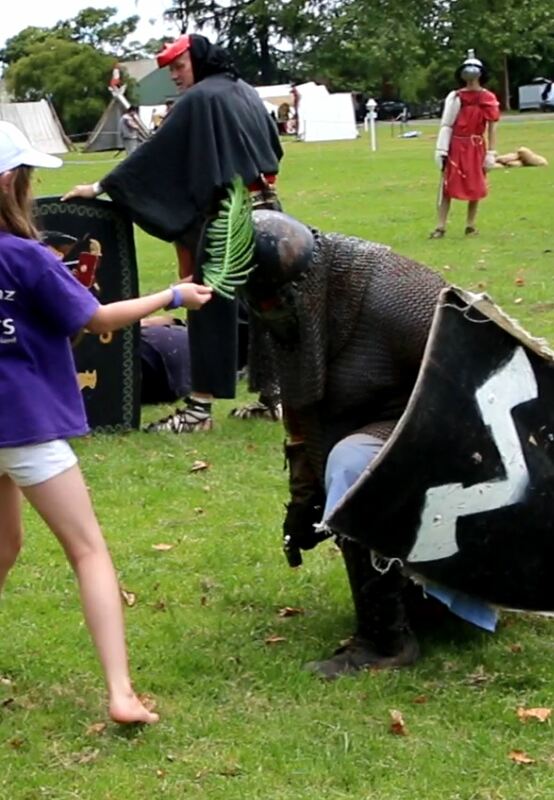 Garry is highly experienced in a great many forms of ancient and medieval combat. 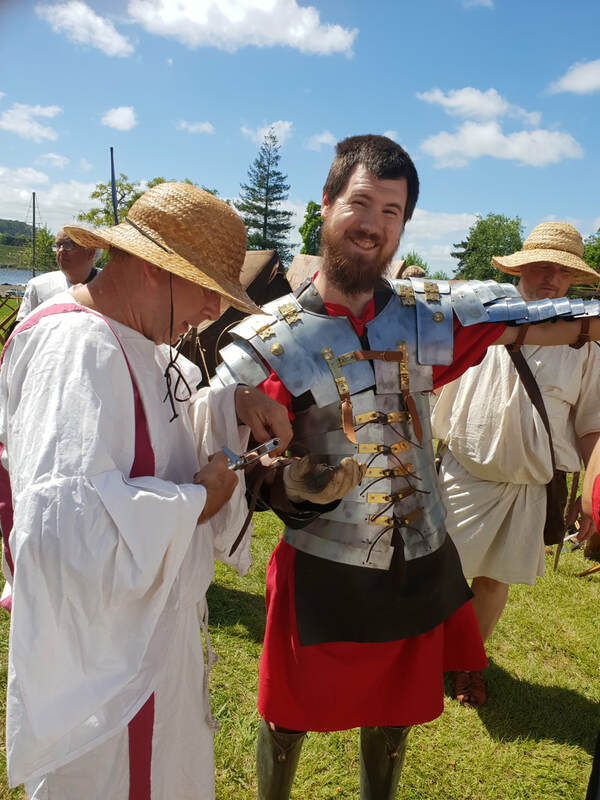 Daniel Dale has marched with the legion for years, acted as an archer firing arrows at the advancing vallum shield-wall of Rome's soldiers, and also fights as a gladiator. 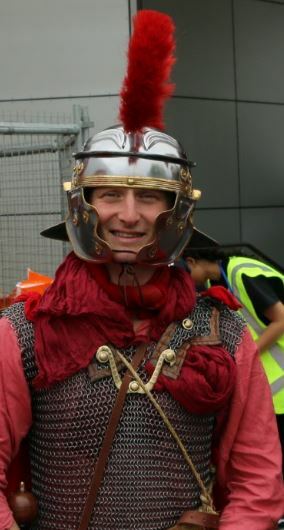 David Mackenzie is ex-Ermine Street Guard, and a knowledgeable scholar on ancient Rome who has constructed high-quality model triremes displayed in sea battle. 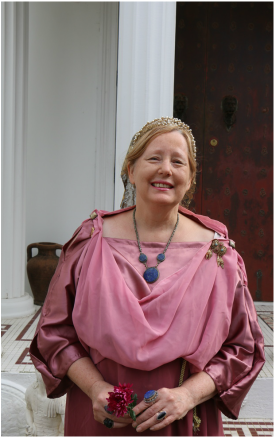 Olivia Mackenzie attends events as a Roman matron, and sometimes as the Egyptian Queen Cleopatra. 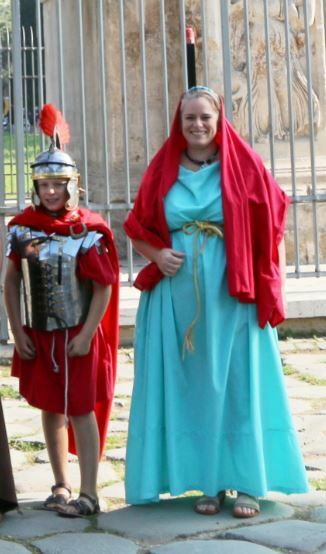 Kirstin Jones plays a noble Roman matron of Civitas Romana, our civilian Romans, and is a valued family member along with her son Nathan. 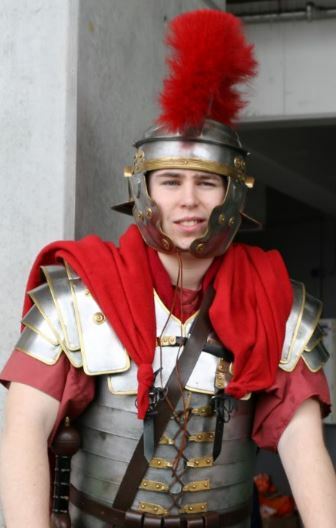 Nathan Jones is our youngest member of Civitas Romana, civilian Romans, and keen student of all things Roman. He has his own legionary equipment and hopes one day to fight for Leg VI. 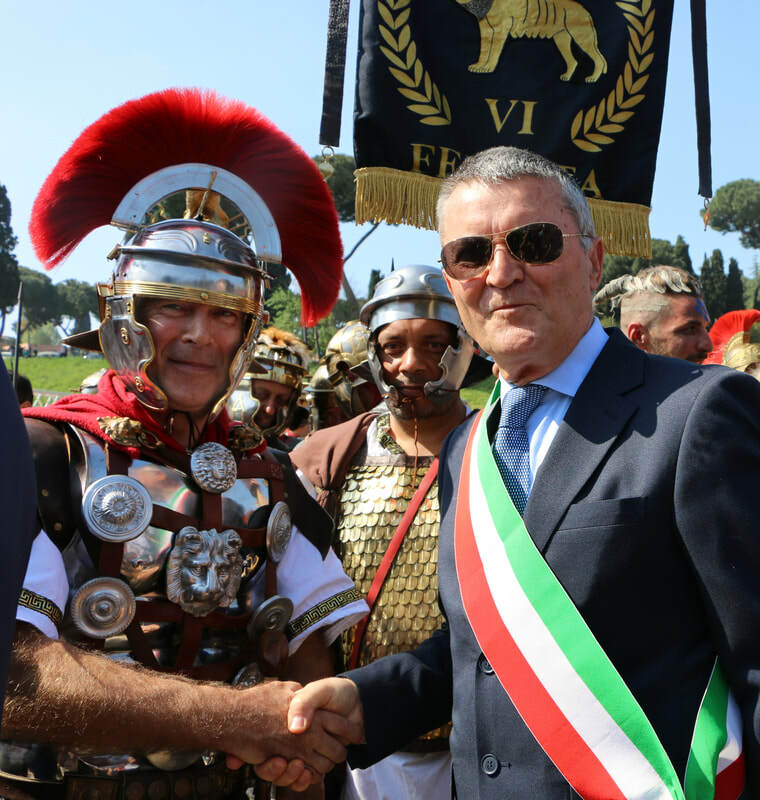 Matthew Poehler (Oskar) fighting in the gladiatorial arena as Caesar, a giant Roman legionary reenacting the defeat of Vercingetorix. Shown here having his helmet knocked off his head and flying through the air beside his shield! 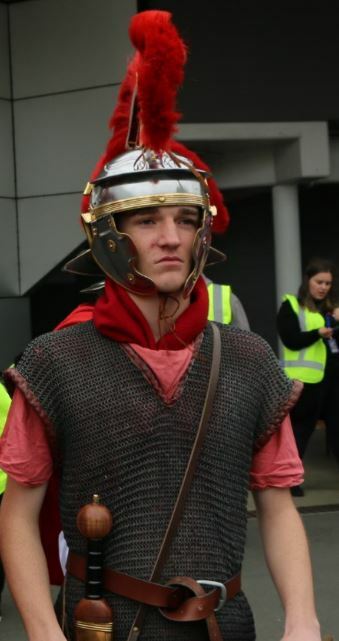 Victor Rosendale (Lucius Antoninus) - vice captain, holds a MA in Ancient History from Auckland University. 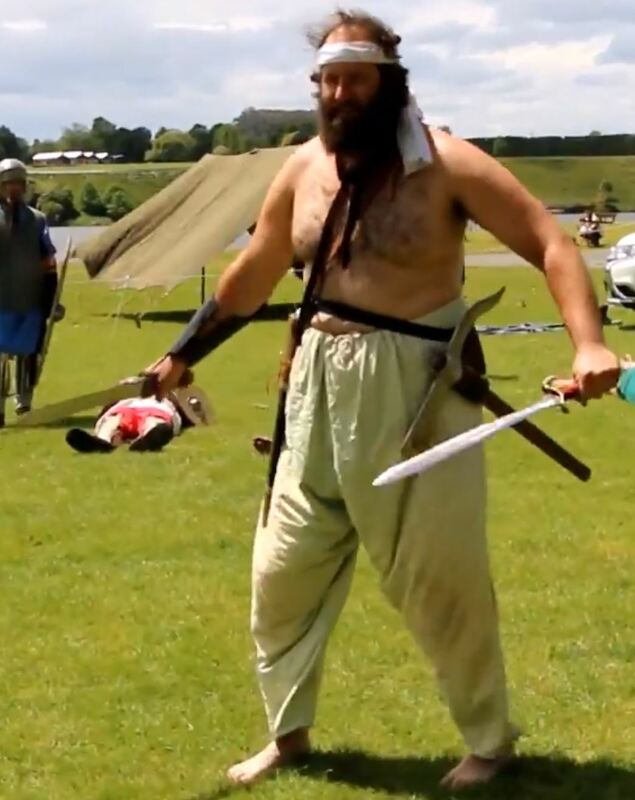 He fights as Lucius the Damned, a giant murmillo gladiator, and competes in international full contact HMB (Historical Medieval Combat) with heavy weapons representing New Zealand. Clinton Smith (Pilosus Pecus) is an expert in mixing alcohols (a fine Roman tradition). He is one of the more intimidating fighters in the legion, and is training for victory in the gladiatorial arena. Daniel Balderrama (Gaius Terentius Varro) is a Classics student with an encyclopedic knowledge of Roman history akin to Pliny the Elder. 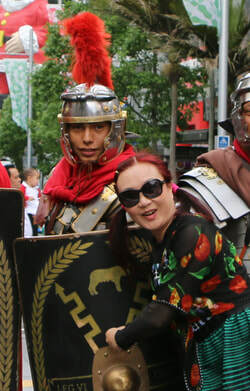 Seen here in the Queen St Santa Parade with an admirer trying to punch her way through his shield - but the line held! 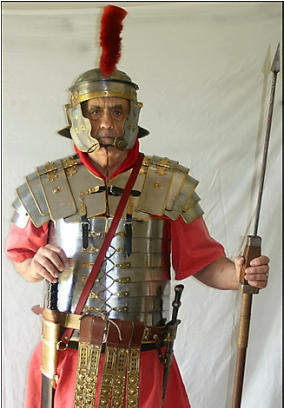 Keith Gerald Mudgway (Pinguis Sus) is a very experienced Roman legionary, archer and sword fighter. Alf Nagels (Appius Naevius Paetus) is a brother in the legion, but also brother to the emperor, so next in line for the throne if the emperor should be assassinated, captured by barbarians or deposed by his Praetorian Guard. He'd make a pretty good emperor, sort of like Vespasian. Dominic Perry is an expert in Egyptian history and author of the History of Egypt Podcast that tells the story of Aegyptus from the creation until the Fall of Rome. You can also chat on his History of Egypt facebook page about all the latest research and news. Highly recommended! Brad Stevens is the legion cornicen blowing the circular trumpet that calls the legion to order, and sounding melodic commands for complex battlefield maneuvers as directed by the centurion. 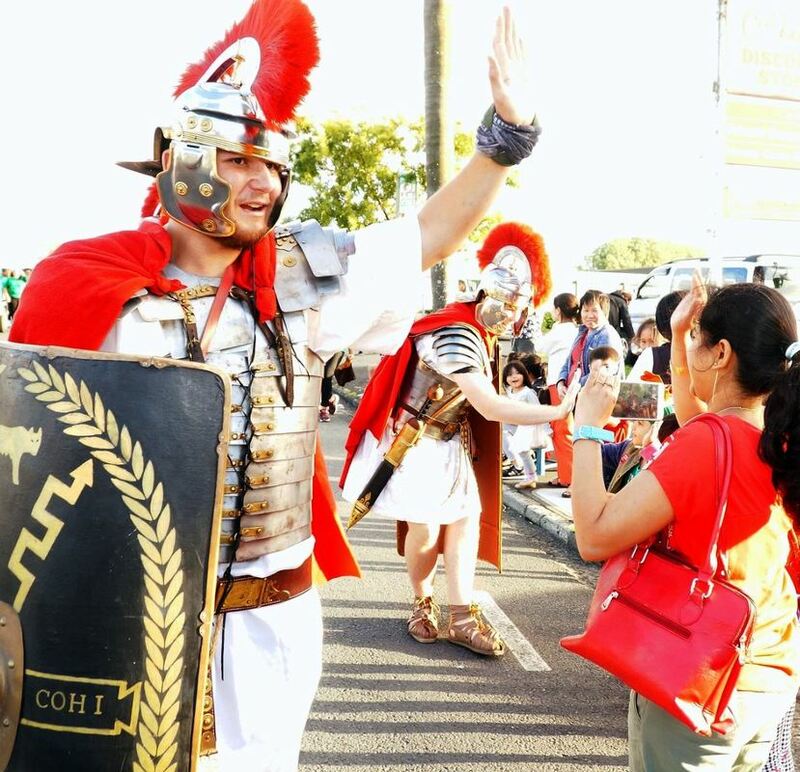 He is a devoted student of Roman history, and interested in everything, from ancient Exekias to ROME: Total War. He is also an augur who can read the future in livers and entrails. 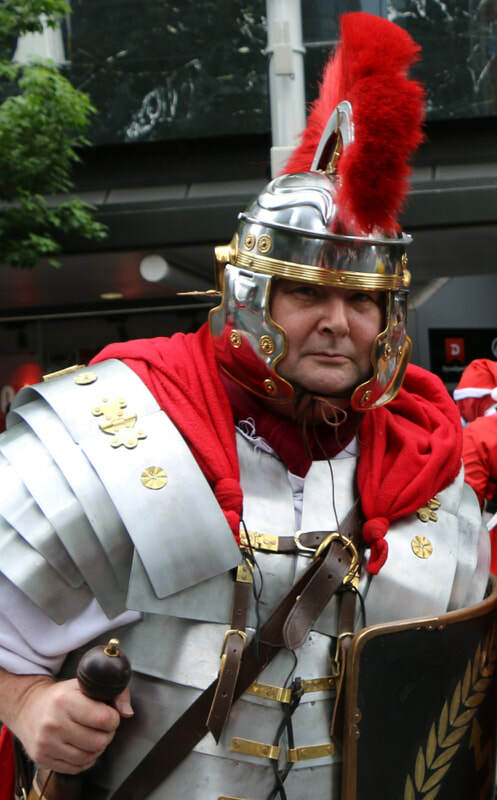 Jeremy Lowe is currently completing a BA in Ancient History at Auckland University, and is the type of good solid legionary that forms the backbone of Rome's army. 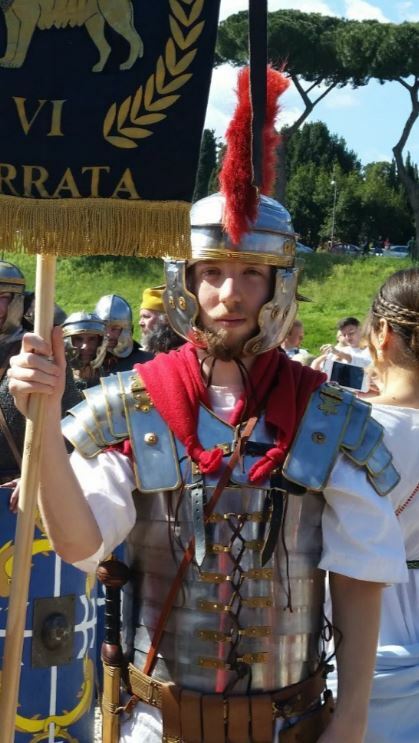 William Dale is a longtime legionary and archer who often helps run the children's activities ("Shoot the barbarian with the manu-ballista"), and likes swinging a gladius in battle. 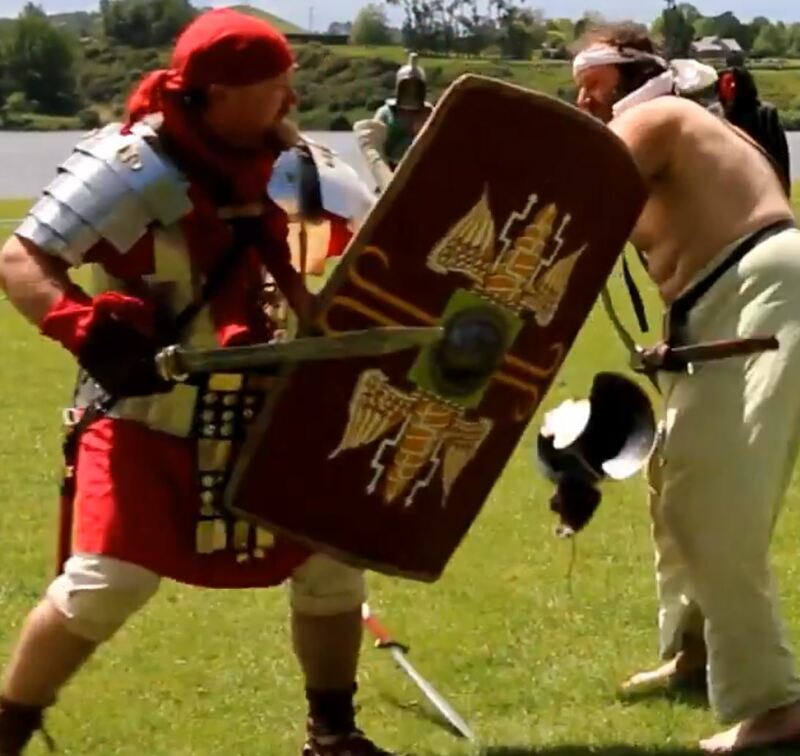 Darin Daisley fights in the gladiatorial arena as the giant Gaul Vercingetorix, a dimachaerus with two swords, and a stolen Roman dolabra in his belt! Donk Tapsell is an experienced HMB fighter, seen here in the gladiatorial arena being blessed by a Priestess of Fortuna before his bout. 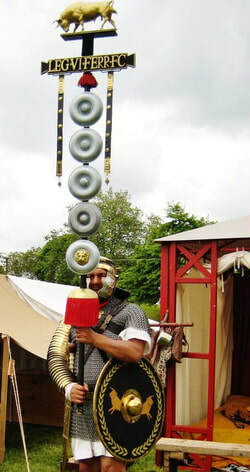 The Roman combat shields are tested for strength against his charge, and generally rated as safe up to 2 Donk. 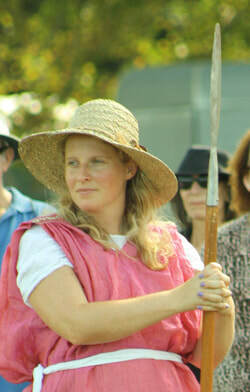 Lisa Clark (Julia Flavia) has a MA in Archaeology and Anthropology (ALM 1991) from Harvard University. Lachlan Matheson marches under the eagle as an auxiliary soldier in chain mail with spear, and fights in all gladiator styles. Aggression is his middle name. Dianne Layzell provides photography, video, logistical support and cucumber sandwiches (it's true!!!). 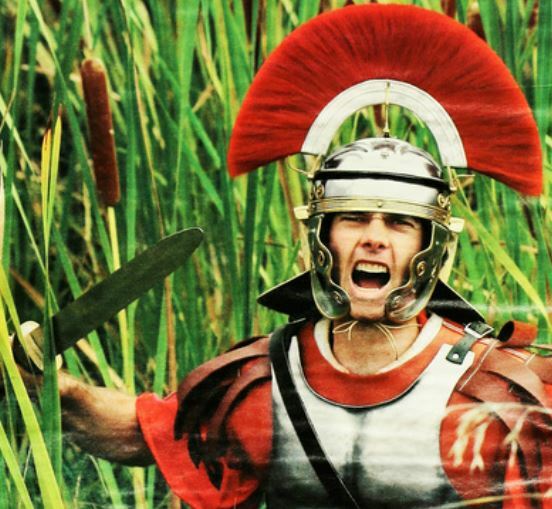 Brent Ruijne (Brenticus) has been a Roman re-enactor for over 15 years and featured on the front cover of the NZ Herald's Canvas magazine in 2006 (above). He has a wealth of knowledge on all things Roman. 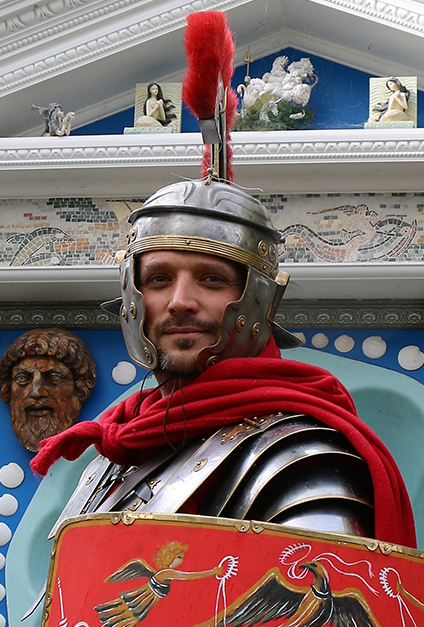 Darren Green fights as a secutor gladiator, Darius of Gaul, in the Roman arena. 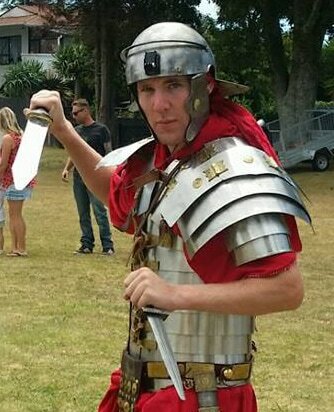 A formidably skilled fighter, he also has the strength, endurance and sheer bloody-minded determination to run the New Plymouth half-marathon while wearing the added weight of full Roman armor as pictured above! 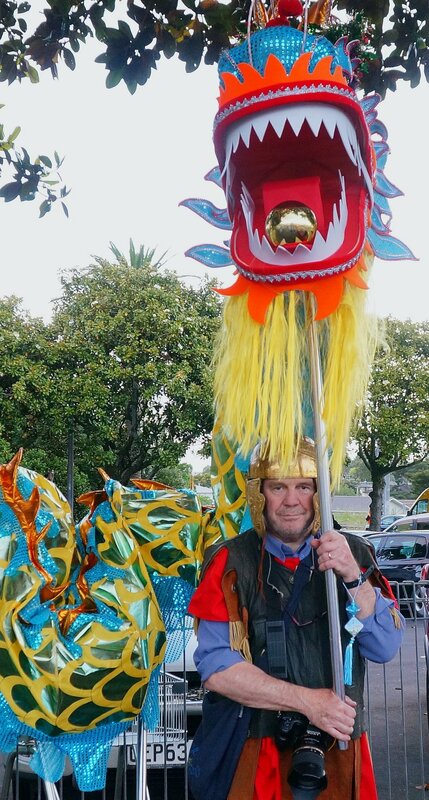 Robert Keam is currently studying at Auckland University and has an impressive command of the Latin language. 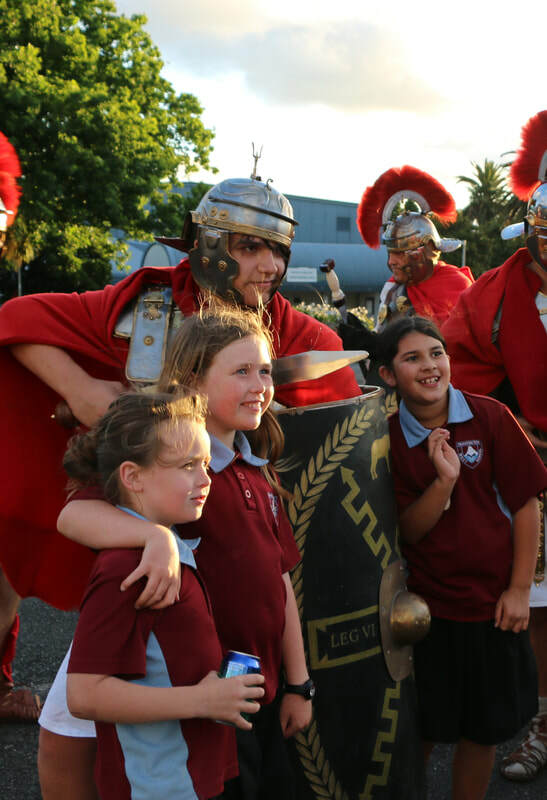 Byron Clark has marched with the legions to commemorate the foundation of Rome in 753 BC, and acted as gladius instructor teaching the students proper sword play at Auckland secondary school displays. Preston Bracefield fights as a Roman legionary, but is also training in all forms of ancient weaponry including spear and ax, in preparation to be a champion of the gladiatorial arena. Rus El is a professional photographer and film maker who records our events, and a talented natural sword fighter. He has traveled to all corners of the Earth photographing dangerous hot spots, and will next be shooting in Afghanistan (with a camera!). Check out his work here. 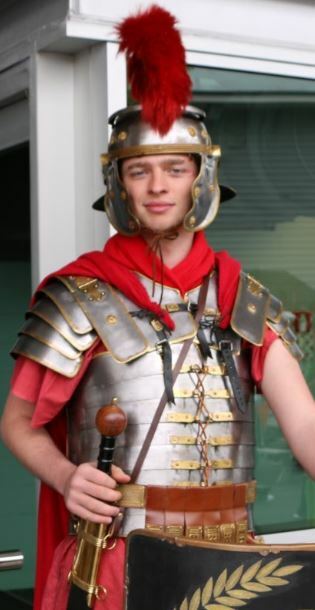 Jason Alan Edgecombe is an experienced fighter in all styles of combat, seen here kitting up for the gladiatorial arena as the heavily armored invincible crupellarius who can defeat two barbarians at a time. 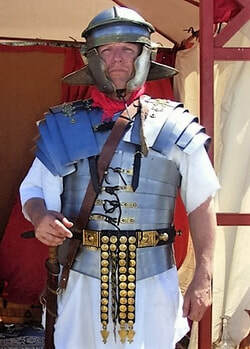 James Belsten is an experienced professional stunt fighter, seen here fighting in the gladiatorial arena as a secutor against the retiarius net-fighter.